I love this time of year! The citrus is ripe and there are so many recipes out there to try! I have the standards that I make every year like orange marmalade, orange jam, and grapefruit marmalade. But what makes winter so much fun is trying out new recipes. You've probably learned this about me my now, but I hate to waste anything! If I can find a use for a lemon peel, I'll use it! If I can't cook it or preserve it, I'll compost it! My dad has the best citrus trees in his yard. I have a few, but they aren't quite established yet. 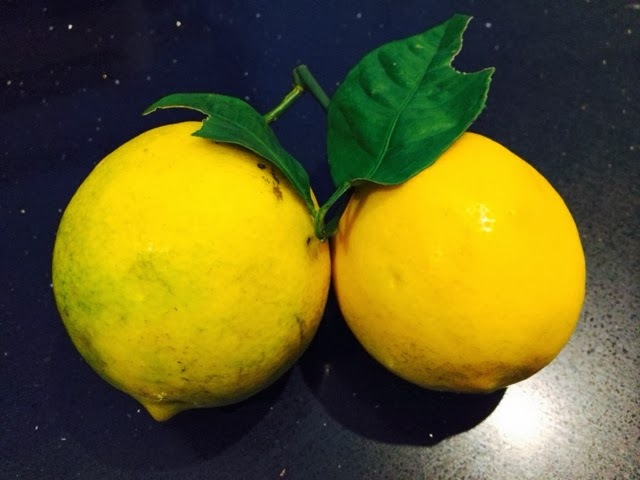 His Meyer Lemon had HUNDREDS on it this year! After making lemon marmalade, salt-cured lemons, and limoncello, there were still....HUNDREDS!! So, in the waste-not frame of mind, I juiced and juiced and juiced. But then I couldn't bring myself to just toss the rinds, so I dehydrated them! Sprinkled on grilled chicken or seasoning for rice. Yum! I like to put lemon slices in the water when I steam veggies, and I'll bet this would be amazing sprinkled on top! I even read somewhere that they used dried citrus peels in a wood burning fire to make the house smell nice. When I juiced the lemons I made sure to remove as much of the fruity flesh as possible leaving me with the white pith and peel. I layered the dehydrator with the peels and cranked it up. It only took a couple of hours. The house smelled divine during the dehydrating! Then I popped the peels into jars to be ground up in the food processor later. I don't know why, but I always expect more than I get. I thought I'd have jars and jars of lemon peels. So there you have it! Dehydrated Lemon Peels! Easy-Peasy. If I have any peels left after all my orange marmalade, I'll dehydrate them! Strangers & Pilgrims on Earth has a whole citrus series and lots of uses for dried citrus as well! I'm planning on making the homemade lemon pepper! YUM!! I have never though of doing that.